This picture above/below (that is somehow cut off and I can’t figure out why…ha!) captures what I’m exploring as an educator right now. How do we simplify our own lives and our student’s lives? Lara Casey (author of Cultivate what Matters) has created a resource called powersheets that help you to plainly set goals and stay connected to what matters. A friend gifted it to me and I have LOVED using it! I highly recommend this resource. It has made me reflect on my life as an educator. We are constantly pulled in different directions, whether it is a standard we need to meet, a parent’s request :), a professional development conference, a colleague/grade level, or our own drive to create. This is where the unit plan has been so crucial. I’m sure many of us have different versions of a unit plan. Over the years I’ve tried different ones, but my tried and true is to use the TCRWP (Teacher’s College) model and make it my own. I’ve focused on coming at this from a writing angle, but you could easily use it for reading too. Test it out with one of your upcoming units and let me know how it goes! 🙂 . Pick out a unit that you typically do at this time of year. Collect your resources for developing the teaching points. There are tons of great ones. 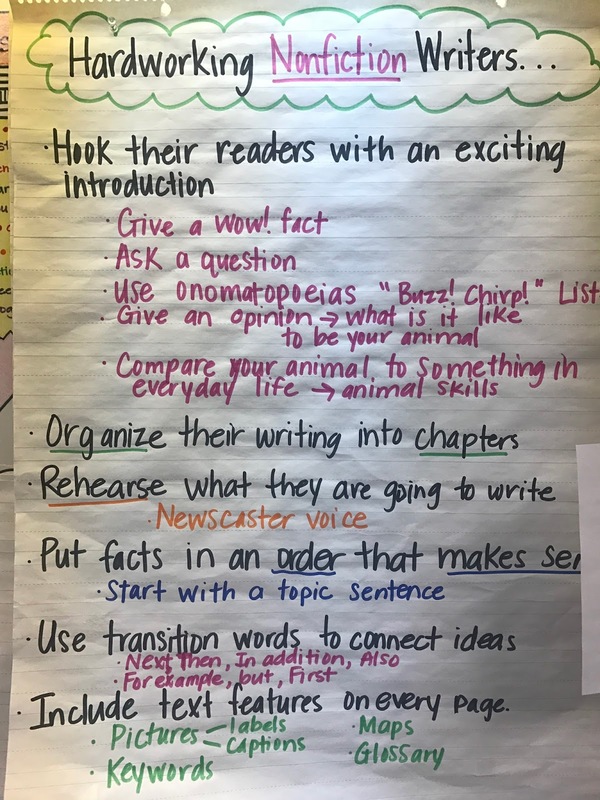 I use TCRWP’s Units of Study, Jennifer Serravallo’s Writing Strategies as my go-to books. I listed a few more below. What resources do you like to use? 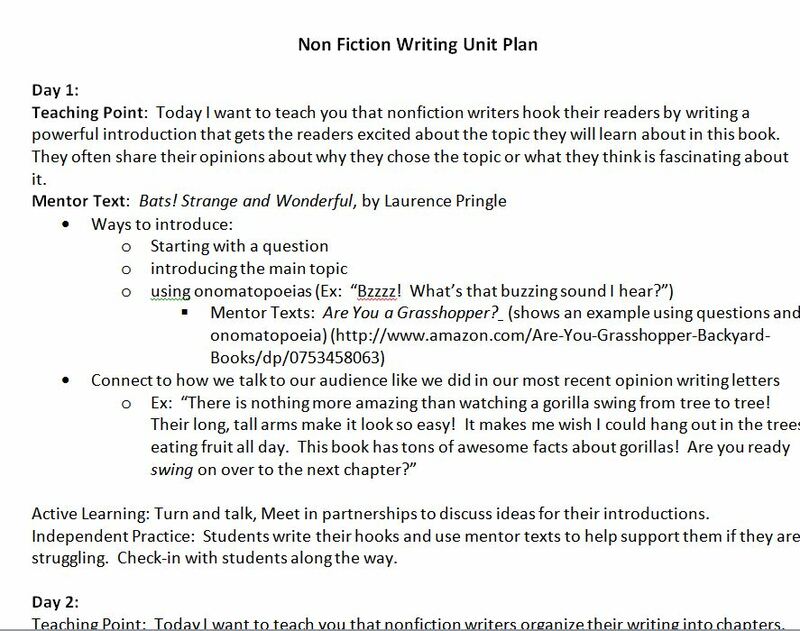 Then, you want to develop your detailed unit plan. This is also in the same google doc above if you scroll down in the document. Include your connection, teaching point, mentor texts, teaching, active engagement, link, independent practice, and share here. Adjust the above to make it work for your purposes. Here’s a tiny snapshot of what it could look like. 5. Refine and tweak as you go. *I come back to this one throughout the unit, adjusting where things go based on how my students respond. My tweak might be that I create a small group or scrap a lesson, or spend 2 days on one lesson, based on my conferring or thoughts I have during teaching. 6. As you move through the unit don’t forget to leave traces of your teaching and the student’s work in the room, so that you can refer to it throughout your unit. This could be your version of the anchor chart. There are lots of ways to do this, but here’s one I learned from Mollie Cura, literacy consultant. Helpful Tip: Take pictures of your anchor charts for the following year so you have a record. You may not do it exactly the same, but having a reference is so helpful! 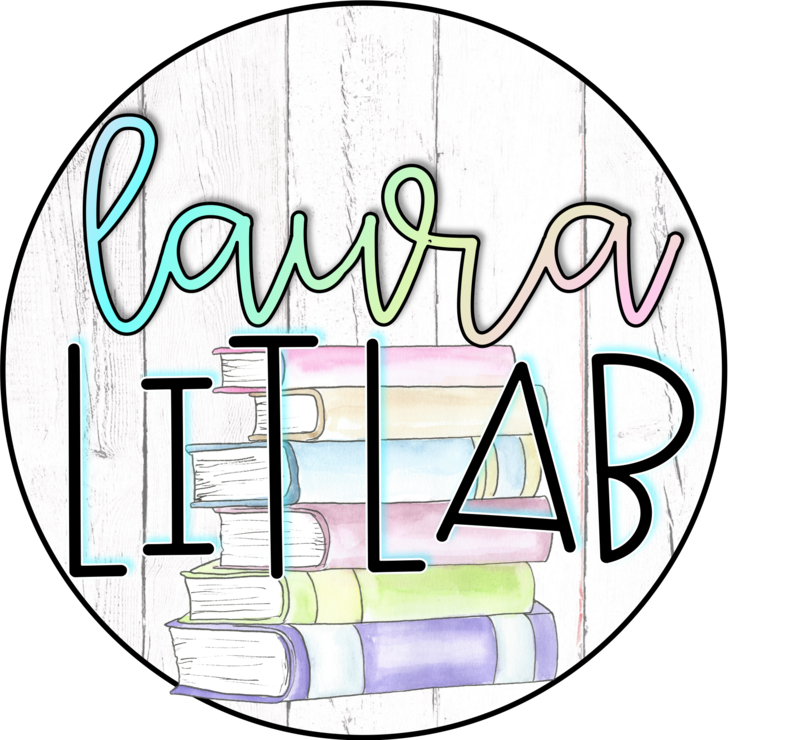 There are lots of resources out there, including the Units of Study book,Writing Strategies book, Rozlyn Linder (Big Book of Details) and lots of other great authors to pull from (Ralph Fletcher, Katie Wood Ray, and more!). Writers __________________ by ___________________ so that _________________. Writers can develop a character’s inside story (skill) by using dialogue (strategy) to show what the character is thinking (purpose). Writer can add details (skill) by zooming in a moment and describing all the sensory details (strategy) so that the writing creates a vivid picture in a reader’s mind (purpose). Writers can link one part of their writing to another (skill) by using transition words (strategy) so that the reader can understand how the author has moved to a new topic or section (purpose). 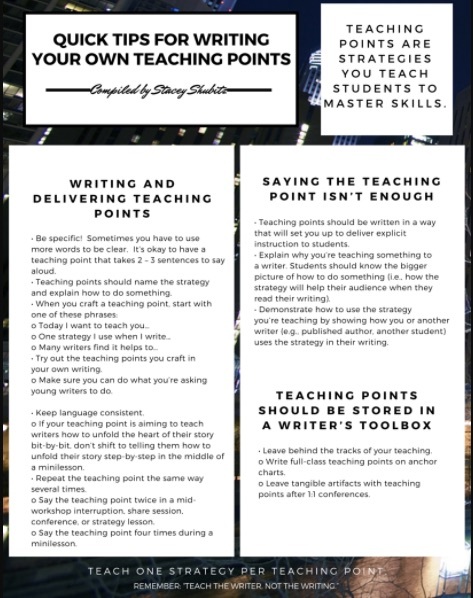 If you’re looking for SIMPLE tips on how to pick out your teaching points, check out the picture from Stacey Shubitz (Two Writing Teachers). She is a literacy specialist and former fourth and fifth grade teacher. She has written the books Craft Moves and Day by Day. If the picture is a little bit fuzzy, click the link below. What unit are you interested in developing/refining? How do you want to “cultivate” or simplify your unit to meet the needs of your students? My student gave me permission to share this awesome drawing that he was inspired to create after reading several more of the series #thelastkidsonearth. He got more books for Easter and two other students are now reading the books. Love when they inspire each other! Thank u @max_loves_pants! #visualnotetaking This year I taught The Civil War & Reconstruction for the first time. @teaching_tolerance, @ibramxk’s book Stamped From the Beginning, Henry Louis Gates series, The New Jim Crow, and my visit to @nmaahc this past summer (using the word enslaved vs. slave -amazing how many resources still use the latter) has been incredibly helpful as I teach this hard history as accurately as I can while being aware of any bias I bring into it. I’m still learning, but these works have made a huge impact. ⁣⁣ ⁣⁣ I’ve also been so impressed with how visual notetaking has provided students with a meaningful way to take notes, particularly since my students have dyslexia. This tool would be great for any student, but my student’s retention of the info seemed to increase. They were particularly interested in the story of The Amistad. ⁣⁣ ⁣⁣ It was also incredibly important to start with the “Danger of a Single Story” which was a powerful set of lessons from @teachandtransform. There wasn’t enough time to teach this unit so I found myself fitting in our study of the history of Ancient Africa in morning meeting time or squeezing it in where I could. We had also discussed stereotypes prior to this unit as well. That exposure was a crucial component (as well as throughout the year) before diving into the civil war. #learningneverends. ⁣⁣ ⁣⁣ Since I teach 4th grade the most interesting reflection responses were about the contradictions that exist within their study of The Constitution. Many students were surprised to learn about the forefathers and we focused on the line “All men are created equal” penned by Thomas Jefferson. Additionally we used #circleofviewpoints while connecting the study to what we learned prior during Westward “Expansion”. This was a lot to dig through and I have much to continue refining and processing.